Looking from the outside, it might appear that leading a children's ministry just requires being good at connecting with kids. While you definitely need to have a heart for kids to be in children's ministry, there is much more involved when it comes to leading the ministry. I am often ask by young leaders who are starting out what they should focus on. 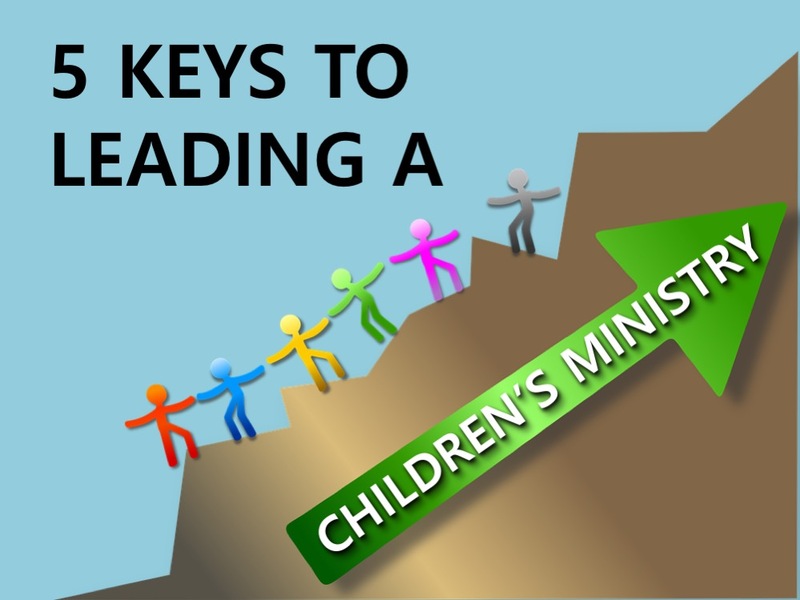 Outside of the time you spend with the kids, here's 5 keys to leading a children's ministry. PEOPLE. I believe this has to be your number one priority. Focus the biggest % of your time enlisting, equipping and empowering people for the work of the ministry. Ephesians 4 confirms this. "Their responsibility is to equip God’s PEOPLE to do his work and build up the church, the body of Christ. This will continue until we all come to such unity in our faith and knowledge of God’s Son that we will be mature in the Lord, measuring up to the full and complete standard of Christ." The key is being an equipper more than a doer. As you invest in people, you will see the ministry grow and flourish. It's not about what you can do, rather it's about what you can empower other people to do. Never do ministry by yourself. Have someone you are training and investing in. The success of the ministry will rise and fall on the strength of the volunteer team you build. PASSION. As the leader, you must set the tone for the ministry. Lead with passion! Have a vision that causes people's hearts to beat faster! The passion of the ministry will never rise above your passion. Be a thermostat rather than a thermometer. This means you set the spiritual temperature for the ministry rather than just measuring it. Give it everything you've got! Pray with passion! Share with passion! Lead with passion! Care with passion! Invest with passion! When people see and feel your passion, they will be drawn to you and it will rub off on them. Remember, passion is not something that can be taught...it is caught. PLANNING. It's your job to plan out where the ministry is headed and what will take you there. Lay out a clear plan for programs, events, special days and other calendar dates. I highly recommend planning a year in advance. You've heard the saying, "Plan your work and then work your plan." It's true...and look what comes first - the planning. One word of caution when it comes to planning. Remember...less is more. A full, busy calendar does not always equate to a successful plan. Focus on doing a few things really well. The goal of your planning should first and foremost be productivity. Planning also involves collaboration. Don't plan alone. Bring people around you to help. Coordinate with other ministries so your plan flows well with the overall church calendar. This is vital for successful planning. PROBLEM SOLVING. Guess what? Leading a children's ministry equals dealing with problems. You will be the go-to-person when problems arise. Be a fixer rather than a complainer. A good leader faces problems and brings solutions. Embrace the messiness of leading. As you solve problems, you will earn the respect and trust of those you lead. PROTECTION. You must protect the ministry. Protect the children by having safety and security measures in place. Make everyone who serves go through a thorough on-boarding process that includes a background check and personal interview where you ask the hard questions. Never allow an adult to be alone with a child. Have an evacuation plan in place. Be aware of food allergies. Have a solid check-in and check-out process. Protect the unity of the ministry. Know how to navigate and mediate conflict. Have the courage to have difficult conversations when it's necessary. You must keep the "alignment" of the ministry on course. Am I spending my time investing in people? How can I focus more of my time in equipping? From 1 to 10 (with 10 being the highest), where is my passion level for the ministry? How can I raise it? Do I have a plan in place for the ministry? Is the plan strategically taking us toward our goals? Is there anything on the calendar that is not effective? How can I narrow our focus? How good am I at problem-solving? Do I try to sweep problems under the rug or do I fix them? How can I improve in this area? Is our ministry protected? Do we have solid measures in place to protect it? Are there any vulnerable spots we need to strengthen? What a privilege it is to lead in children's ministry. What a joy to be chosen by God to help reach the next generation. There's nothing better! And it deserves your very best! Lead well!